Piles and piles of disgraced Chinese soldiers... and then some! 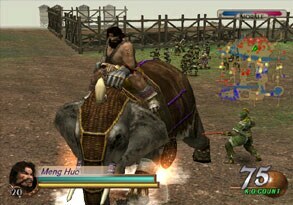 Dynasty Warriors 3 expands with this low-priced disc full of new adventures, weapons, items and movies. I like beat-’em-ups. A whole lot, in fact. My favorite NES game for most of the time I was growing up was Teenage Mutant Ninja Turtles II. Then I finally saved up enough for River City Ransom, and it’s still my favorite NES game. 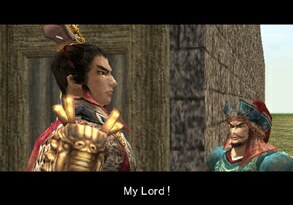 I also like Romance of the Three Kingdoms, which you probably realize is the basis for the Dynasty Warriors series. Presumed written in the Ming dynasty and regarded as one of the greatest works of literature of all time™, it covers the fall of the later Han dynasty, the rise and fall of various warlords, the rise and fall of the three kingdoms, and finally the rise of the Jin dynasty. It’s a pretty long book. So anyway, I’m pretty biased when it comes to Xtreme Legends, which, by the way, isn’t a game so much as an add-on. Well, almost. See, it’s a game and it’s an add-on. 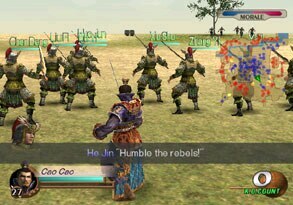 That is to say you can play it by itself, or in conjunction with Dynasty Warriors 3. The way it works is this: Xtreme Legends contains Musou (story) modes for only the seven characters (Diao Chan, Dong Zhuo, Lu Bu, Meng Huo, Yuan Shao, Zhang Jiao, and Zhu Rong) that didn’t have them in DW3. XL also lets you play free mode with all the officers, but only in the XL stages. In order to play musou mode with the old characters, or free mode in the old stages, you have to boot up XL, then use the "load original data" menu option and put DW3 in, then put XL back in, and you’re good until you reset. If you have DW3 save data, all your officer stats and items will be imported into XL. However, you’ll lose your rankings, officer ranks, and bodyguard stats (which I’ll talk more about later). The new Musou modes vary from good to insanely good. There’s only 7 officers and 22 new movies, so it’s obvious that there’s a lot more officer specific movies than in plain old DW3. However, all the new stages are really arranged versions of the old stages. 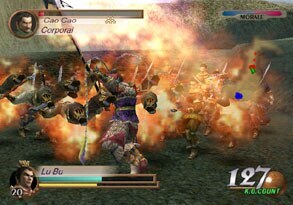 For example, Diao Chan’s Escape uses the same map as Guan Yu’s Escape, only no carriage and the enemies and events and whatnot are all different. The stories are all completely original, as all the unaligned officers either died early on in the book or only appeared for a short time. The new stories are also somewhat ridiculous, so if you’re a die-hard Three Kingdoms purist, you’ll no doubt be offended, especially by the almost unbelievably zany (even for DW) Zhang Jiao and Meng Huo stories. Of course, if you’re a purist the giant fan wielding Qiao sisters and basically all of Dynasty Warriors might put you off anyway. The new musou modes are great fun 2-player, the second player can’t choose from the non-XL set of officers even if you load your original data (why Koei, why?). You can of course still play 2 player mode with the non-XL officers in the original musou modes. In addition to the new musou modes, there are several other new features in XL: additional challenge modes, a new Very Hard difficulty setting, 5th weapons for all officers, two dozen or so new items, the ability to use an officer as a bodyguard in single player Free mode, and a new bodyguard system. The new challenge modes are a definite improvement over the somewhat lame old ones. There’s one where you attempt to race to the finish as quickly as possible while avoiding hordes of enemies, another where you try to gain as many combo points as possible, and one where you try to knock enemies off the bridge at He Fei castle without falling in yourself. There’s also an ironman mode which combines the three. Beating or matching the default high score in any of these will net you a new item which can only be obtained in this manner. Your officers also utilize their stats from the rest of the game in challenge mode now, unlike DW3 where they always defaulted to original stats. The aptly-named Very Hard difficulty setting is great for everyone with a maxed out Lu Bu who complained that hard was too easy. It’s also the difficulty you have to play on if you want to acquire the 5th weapons. Which, by the way, have new in-game models. The new items are pretty good, including Musou Armor, which prevents your attacks from being interrupted by arrows. The only real complaint about this game is related to the new bodyguard system. Bodyguards are no longer leveled up on a per-character basis, which I think is a big improvement. However, you lose all your bodyguard levels from DW3, hence the complaints. Anyway, now you can have a couple groups of bodyguards who you can name and change their appearance (to Nanman, Amazon, Male Soldier, or Female Soldier). There are also bodyguard items and weapons now, with your bodyguards, as a unit, being able to equip one weapon and one item. The weapons are the same as in DW3 (bow, crossbow, sword, spear, and halberd), except now there’s 3 levels of each and you can find ones with random bonuses, much like normal weapons. The bodyguard items are in the same vein as the officer items: defense up, HP up, and the like. As for officer bodyguards, being able to use them in free mode is kinda fun but maybe not as useful as you would think. 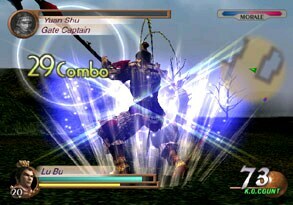 On Very Hard, even a maxed out Lu Bu or Xiahou Dun will meet a quick death. You’ve read the book, played all the games, and still want more Three Kingdoms? Keep an eye out for the Chinese Three Kingdoms TV series on DVD, totaling about 70 hours long. The first 2 or 3 episodes aren’t especially great, but it gets insanely good shortly after. Of course I’m only about 15 hours in, after all.